Are Technology Jobs Really Out There for Your Kids? – Media! Tech! Parenting! Are Technology Jobs Really Out There for Your Kids? Lots of parents think about the types of jobs their children will hold as adults, but today these days fast-paced technology changes loom large, so adults may need to adopt a new mindset when it comes to understanding the ever-changing nature of employment that today’s children will encounter. In a July 12, 2011 column in the New York Times, Pulitizer Prize-winning writer Thomas L Friedman (The World is Flat), writes about jobs and the technology world. 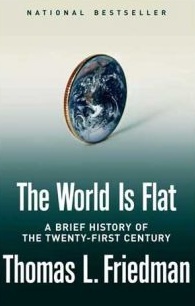 (or as he often calls it the “flat world”). In his opinion piece, The Start-Up of You, Friedman points out that all of the employees from the big, but newish tech firms (such Facebook, Twitter, and Groupon) can fit into Madison Square Garden with seats to spare. Basically, these firms are not creating that many jobs. … while many of them are hiring, they are increasingly picky. They are all looking for the same kind of people — people who not only have the critical thinking skills to do the value-adding jobs that technology can’t, but also people who can invent, adapt and reinvent their jobs every day, in a market that changes faster than ever. Read the entire article. Read Friedman’s bio at the Times.